Remember those pale wedges of iceberg? ...the rust marks along the edges...bottled blue cheese dressing? Yeah, us too. Not that this lovely little salad plate will remind you of it. Not at all. Long gone are the days when only "a meat and two veg" qualified as a real meal; today, says Sara Foster, "salads are meals, sandwiches and quesadillas qualify as respectable grown-up dinners (or breakfasts or lunches, for that matter), and eggs can be eaten any time of day." In this new cookbook, Sara acts as a mentor to the rest of us, sharing her passion for practical, comfortable cooking at home with more than 100 recipes for everyday meals. As the owner of two of the mid-Atlantic's busiest gourmet markets, Sara shares her professional knowledge about ingredients and techniques, incorporating the changing trends in cooking, health, and entertaining. Formal is out; instead we want relaxed, versatile recipes that are full of flavor but don't require precision cooking or fussy techniques. We want to approach cooking with a sense of comfort and ease, and Sara Foster's Casual Cooking teaches us how: it is relaxed yet refined, homey yet sophisticated, showcasing the kind of meals we all want to eat - and will actually cook, day in, day out. 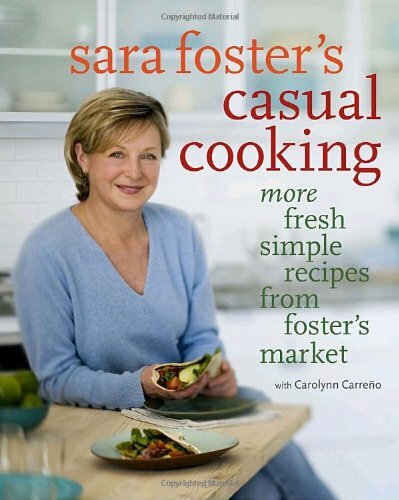 In Sara Foster's Casual Cooking, Sara will help you navigate both the kitchen and the market with greater ease, resulting in satisfying meals that won't take all day to make. The recipes include the most popular dishes at Foster's Market and her own personal favorites, and all feature the updated Southern flair that has made her one of the South's best-known cooks.